Apply Eye Shadow in coy to lid and blend along lower lashline. Blend Eye Shadow in vintage in crease. Press Eye Shadow in dove cloase to the lashes along lower lashline. Thily line upper lashline with Liquid Ink in black. Coat upper and lower lashes with Lash Lengthening Mascara in black. Apply Creat Blush in fig to apple of checks. 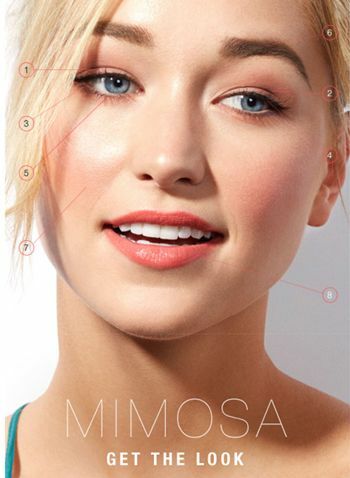 Apply Cream Glaze Cayon in mimosa.